Ted Grant was a heavyweight boxer inspired to become a crimefighter after reading the (comicbook) adventures of the Green Lantern. Like many of the Golden Age characters, he was pretty much forgotten after once the Silver Age rolled around, but he found a new niche in the '80s and '90s, when writers like Beau Smith used him as a trainer and mentor to other characters. 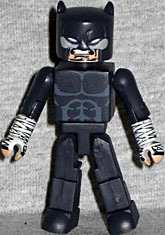 The Minimate is dark grey with lighter detailing to create his muscles. His hands and forearms are painted with complex wraps, and his fingers are pink. Unlike most of the DC Minimates, his mask isn't a tube with a face painted on it - ratherm he gets the usual "Marvel style" mask, with a cutout to allow the mouth to show through. The details of the mask are sculpted: the ears, obviously, but also the cheeks, the eyes, even the wrinkles on the eyebrows are all permanent parts of the mask. Ted's face looks aged but not elderly. At some point in the comics the character was apparently granted nine lives (ough. ), so despite being born in the first two decades of the 20th century, he doesn't look like a 100-year-old man. He is graying around the temples, though - there's a new hair piece, the same color as his suit, but with gray all around the ears. Wildcat's partner in this set is fellow JSA-er Jay Garrick, the Golden Age Flash. He got his powers when he fell asleep and spilled some chemicals, then huffed the fumes. By that logic, the next incarnation of the Justice League will be populated entirely by hicks with access to spray paint and brown paper bags. Flash gets a belt with a sculpted buckle, and his chest is painted with a big yellow lightning bolt - technically it should be on more of an angle, but that's not too distracting. What is odd is his helmet: it sits flat on top of the Minimate head, rather than fitting down over the head; granted, it's hard to get interior space in something as flat as Jay Garrick's helmet, but they could have inset it at least a little. On the other hand, while he has a huge forehead if you look at him from straight ahead, no one looks at their toys like that. If you look at him from a slightly elevated angle (say, the toy is standing on your desk and you're sitting in a chair), then the fact that the helmet is raised allows you to see his eyes beneath the brim. Wildcat is a very nice Minimate, and Golden Age Flash may have some weird design issues, but he's not bad, either. As usual, the only downside to these figures is that the DC Minimates didn't take off the way the Marvel line did. This entry was posted in Art Asylum, DC, MMMR and tagged Minimates. Bookmark the permalink.